Ebisuko is a festival that takes place at Buddhist temples and Shinto shrines in the fall and is all about praying for success in business. A group of patrons or merchants offer gratitude to their temples and shrines for giving them good health and business for the past year. During the Ebisuko period, there will be many shops selling ornaments shaped like a rake, which symbolizes raking up good fortunes and treasures. Please enjoy this different festival flavor at Ebisuko. 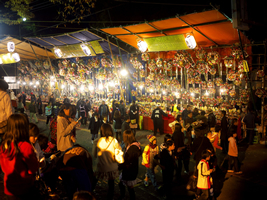 Ebisuko in Kiryu's Nishinomiya Shrine takes place on November 19 and 20 every year. An array of food stalls and Ebisuko ornament stores will be set up there. Vendors will sell hot snacks such as Oden, or Japanese stew, and Yakimanju, or roasted buns covered with sweetened soy sauce. The turnout is usually very large. You will find the hot snacks very tasty as the night falls and the wind gets colder. As Takasaki is the home of merchants, its Ebisuko is a big celebration. Stores on many of the shopping streets in the city will hold a large sale and lottery with deluxe prizes. Ebisuko in Numata will take place on Honchodori Avenue. Roads will be closed to vehicles for the occasion. Street stalls on both sides of the avenue will have a big sale. Coinciding with Ebisuko, a woodcraft festival and a soba (buckwheat noodle) festival will also be held. Shopping streets in other parts of the city will offer various fun events as well. Takasaki and neighboring municipalities are major producers of wheat and other farm products in Japan. Eating pasta has long been a part of the local food culture. This event is organized to further promote such culture. In honor of the Akimoto Clan who ruled the Soja Area in the Edo Era (1603-1867), this festival started in 1990 for the purpose of giving an opportunity for the residents of Soja to know more about their local history. There still remain many historical sites and cultural assets in the area. During the festival, the residents can see important cultural assets from the Edo Era at the Soja Museum that will open specifically for the occasion. A warrior procession will take place once every two years, and this is the year. 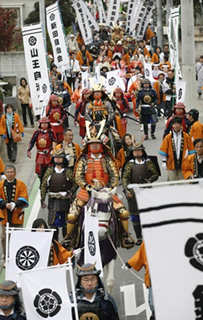 At 1 p.m. on November 6, a group of people dressed as samurai warriors will depart from the new Soja Kominkan, or community center, and march along R15 in central Maebashi for about two hours before returning to the Soja Kominkan. Other festival features include exhibits and stage performances regarding the history of Soja. (10:00-15:30) and the kickoff rally (12 noon). 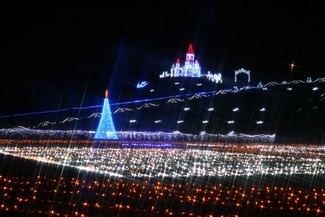 The illuminations in Ota are one of the largest scale light displays in Gunma. Lined with one million LED light bulbs, the Hokubu Undo Koen or North Sports Park of Ota will become one gigantic spectacle to see, visible from the nearby roads and from the elevated highway of the Kitakanto Expressway. Seventy million light bulbs will be used to decorate the entire park and majestically illuminate the winter flowers. As from November 5, Christmas begins and a tall fir tree and other trees are decorated for the holidays. Why not enjoy the atmosphere of an early Christmas there?